This story was originally published in Reader's Digest in December 1991. This Christmas, a 45-year-old black-and-white movie I was lucky to have had a role in is lighting up television screens all over America, as it does every year. The name of the picture is It's a Wonderful Life, and it is one of the greatest, most popular movies of all time. What accounts for the phenomenal success of a film about a small-town businessman who gets so desperate over losing what to him is a large sum of money that he thinks seriously about throwing away his life? Frank Capra, the man I consider the greatest of all my directors. Oddly enough, when It's a Wonderful Life first came out right after World War II, people didn't seem very interested in its marvelous story. Maybe they'd been through too much and weren't ready to watch a movie that asks the most fundamental of all questions: Is life worth living? It nearly broke Frank's heart that audiences didn't rush to see the picture back then. 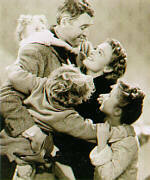 "All that I was and all that I knew went into the making of It's a Wonderful Life," he said. But I'm getting ahead of what I'd like to tell you. 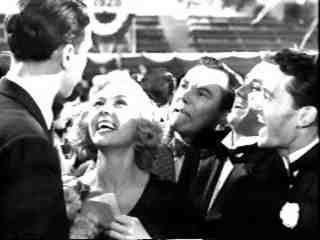 You see, you have to know Frank Capra's own story to understand why the movie is so great. What makes his pictures unforgettable came from Capra himself--out of his own wonderful life, with its unquenchable optimism and his belief that "all will yet be well." of freedom!" Frank never forgot that moment or what it meant to his family. when Frank, after only three months in his new land, was chosen to lead his school in pledging allegiance to the flag--in English! That day Frank Capra discovered what would later become one of the most important themes of his movies: "One nation...with liberty and justice for all!" exemption. But Frank enlisted in the Army and was assigned to teach mathematics to artillery officers in San Francisco. He ended the war with a severe case of influenza--and no job. $20,000 to design alcohol stills. Frank turned them down flat. Then he saw a want ad. A movie production company needed an experienced director. "I'm from Hollywood," Frank fibbed. He got the job--and later, ashamed, would apologize for lying. the five top Academy Awards--a record that remained unbroken for 41 years! were so happy Frank made up his own bedtime prayer: "Lord, help us all to be good and kind, and give us peace in our house and in all other houses." Vanderhof was played by that marvelous actor Lionel Barrymore. Lionel expressed Frank's contempt for people who value money and position over kindness and love for one's fellow man. That film reflected two of Frank's strongest beliefs: "Love thy neighbor" and "The meek shall inherit the earth." Without preaching, his films showed that life's true riches lie in family, country and God. became a part of the military training of every member of the armed forces. Gen. George Marshall personally pinned the Distinguished Service Medal on Frank for making those films. Afterward, Frank went into the first washroom he could find, locked a cubicle door behind him and cried like a baby. Tale of a Lifetime. 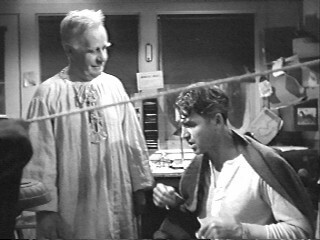 When Frank returned from the war, RKO studios handed him a short story called "The Greatest Gift," by Philip Van Doren Stern. "Wow!" said Frank when he read it. "That's the story I've been looking for all my life." his wings yet, you see. But he comes down to save you by jumping into the river. But Clarence can't swim, so you save him." And then Frank stopped dead. He said, "This--this story doesn't tell very well, does it?" Well, I just said, "Frank, if you want to do a movie about me committing suicide with an angel with no wings named Clarence, I'm your man." Frank had never worked on a story that meant so much to him. He changed the name to It's a Wonderful Life, and we started to shoot it in the spring of 1946.
asks God for help. "Dear Father in Heaven," I say, "I'm not a praying man, but if you're up there and you can hear me, show me the way." spontaneous, I didn't think I could do it over again. their job, or take radiation treatments, 'You are the salt of the earth, and It's a Wonderful Life is my memorial to you. No man is poor who has one friend. Three friends and you're filthy rich!' 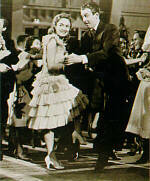 "
Liberty Films, the independent company Frank had founded. It was one of the lowest lows of Frank's life. He made only five more feature films and an educational series for television. 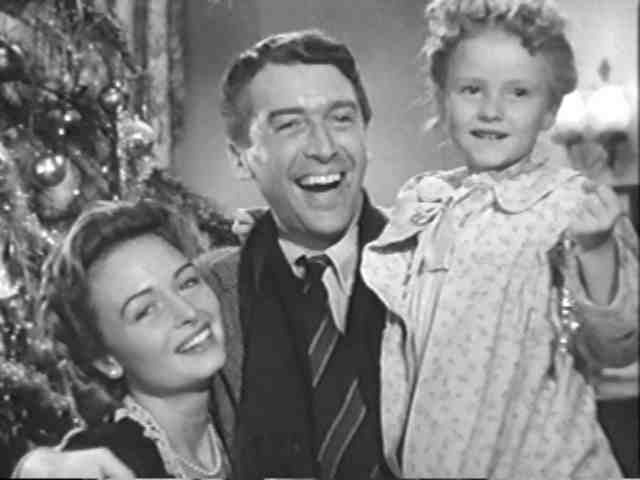 Meanwhile, It's a Wonderful Life began playing on televisions every Christmas. Groups of friends gathered in one another's homes on Christmas Eve to decorate the tree and watch It's a Wonderful Life together. Frank and I started getting the most amazing letters about the effect the film was having on people's lives. "I don't know if this means anything to you," many of them would begin, "but your film has been an inspiration to me." wrote: "In an increasingly impersonal world, this is an urgently needed message: that we count." Frank died peacefully, in his sleep, last September 3 at his home in La Quinta, Calif. He was 94. I can't help thinking now that if Frank Capra had never lived, we would all be the poorer for not having his wonderful movie to celebrate every Christmas. "What an idea!" I remember Frank saying when he first read the story on which his magnificent and enduring film is based. It's the kind of idea, he said, that people will remember and enjoy forever. How right you were, Frank! How right you were. Read an article written by Jimmy Stewart about his making of the movie, It's A Wonderful Life, which appeared in GuidePost magazine. among the year's top grossing films.